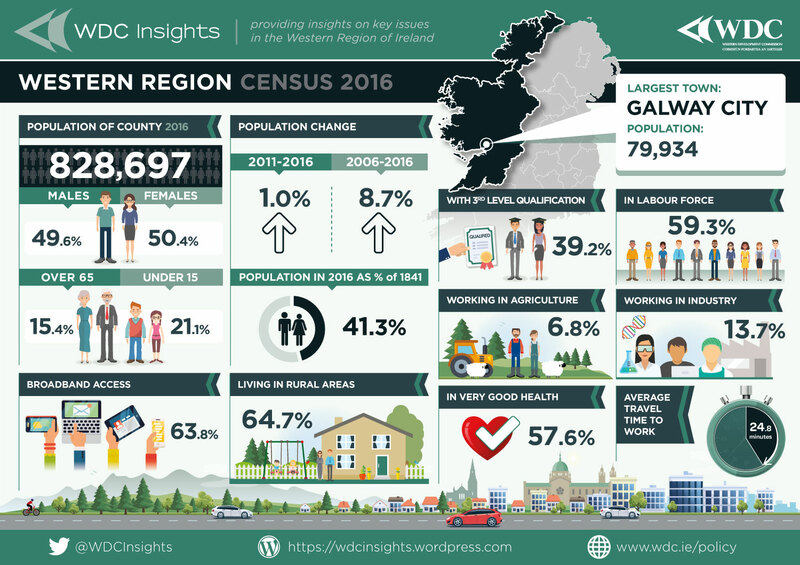 The Western Development Commission (WD C) has just published a series of eight infographics showing of key statistics for the Western Region and each of its seven counties. 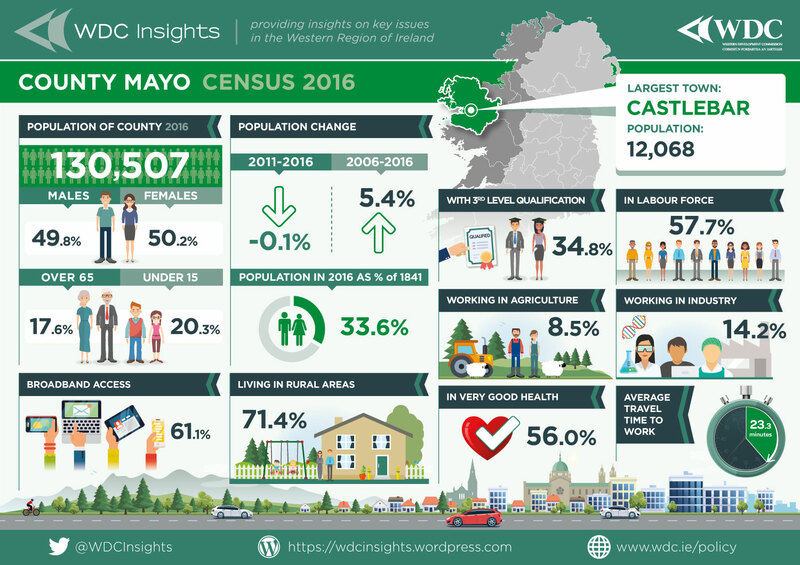 The data is from the CSO’s Census of Population in 2016 with analysis by the WDC. The Region has more females (50.4%) than males but there are more males than females in Roscommon and Leitrim. Fifteen percent of the population are over 65 and more than a fifth are under 15 (21.1%). There is a good mix of statistics highlighted on the infographics, showing access to broadband (64.5% in Clare) and also that most of the population consider themselves to be in very good health (58.7% in Galway). The infographics also give information about work and education. In the Western Region the average time taken to travel to work is 24.8 minutes. 57.9% of the working age population in Sligo is in the work force and 40.7% have a third level qualification. Two employment sectors are also shown. For example in 14.2% of Mayo’s workers are in Industry and 8.5% working in agriculture. This entry was posted in Population, Regional Development, Regional Statistics, Rural Development, Uncategorized and tagged CSO data, infographic, Population, regional disparity, Regional GDP, Western Region. Bookmark the permalink. Good insight and knowledge on the Infographics. Thank you for sharing this information. It was very helpful.